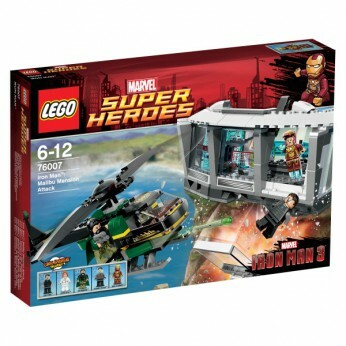 LEGO Super Heroes Iron Man: Malibu Mansion Attack features Malibu Mansion section, DUM-E and the Mandarin’s helicopter. Includes 5 minifigures…. The Mandarin and his Extremis soldier are launching an attack on Tony Starks Malibu Mansion. Battle their high-tech helicopter’s spinning rotors, four flick missiles and side-mounted cannons with LEGO Marvel Super Heroes Iron Man! Get to the armory and suit up before the bad guys fry Jarvis circuits! LEGO model number: 76007: Includes 5 minifigures: Tony Stark, Mark 42 Armour, Pepper Potts, the Mandarin and an Extremis soldier. The Malibu Mansion section features an exploding window function, a rotating computer console with holographic screens, some tools, an armoury with exploding floor function and a kitchen area with cupboards, a blender and assorted tools. For ages 6 years and over; EAN: 5702014972728. WARNING(S): Not suitable for children under 3 years old. To be used under the direct supervision of an adult. This toy costs approximately £34.99 (for the latest and best prices make sure you check our retailer list for the LEGO Iron Man Malibu Mansion Attack 76007 above). In our review of LEGO Iron Man Malibu Mansion Attack 76007 we classed it as being suitable for ages 4 years, 5 years, 6 years, 7 years, 8 years but recommend you check the manufacturer specific advice before purchasing.